Hello there! Things have been a little quiet around here this past week, so I just wanted to pop in and catch you up on what's been going on over in my world. I can't believe June is just a day away, although I do feel like May was a really long month! Probably because a lot happened in May. I think last week, everything just kind of caught up to me and I was feeling a bit overwhelmed with blogging, reading blogs and just social media in general. When that happens, I just naturally disengage and I think a little break is always nice. We also had some really late nights last week, visitors from out of town, and lots of home projects we are trying to get somewhat accomplished before Jim's folks arrive later this week. This past weekend, my dad and brother visited us for the day on Saturday and Sully was just delighted to have them here. He seriously adores my dad and it's the sweetest thing ever. I actually felt a bit teary when they left, especially since for about ten minutes after their departure, Sully just keep saying "Deda gone. Deda gone. Deda gone", with a look of absolute rejection on his little face. Yesterday, Ange picked me up in the morning and we drove out to Canmore to run the Rocky Mountain Soap Factory 10K run. I haven't really been running much lately and I was definitely not looking forward to this race. I was prepared to walk most of it if need be even. Luckily, Ange has been running races for fun lately so she was more than happy to stick with me and we ran the whole thing together. I have to say, running with a friend, even on race day, is so much more pleasurable (for me) than running alone. I'll recap the race later, but we had such a blast yesterday. We mostly ran, walking up the huge hills, but we also stopped to take pictures and we talked almost the whole time. When I got home yesterday, I was exhausted and my body hurt all over (hills are hard work!!). I also had some terrible chafing on my chest where the bottom strap of my sports bra rubbed. I just hung around home with my boys for the rest of the afternoon, then finished off the evening with yoga and a nice long bath. I'm not really a bath person, but I knew I needed one last night. Overall though, May has been a really busy month. I've run three races, tried out Surf Set Fitness and I've been going strong with my workout streak. The past week and a bit, I've been pretty tired and so my workouts have mostly been yoga based, but even that is a huge improvement for me! I've always been one of those people who does yoga here and there, so the fact that I've been doing some type of it everyday is a big accomplishment. I'm also trying to get in my beloved BodyPump at GoodLife Fitness whenever I can and I realized I really miss meeting up with some of the #BlogSquad for a class on Sunday's. That's the one downfall of warmer weather and summer months - we all get too busy to meet up more regularly. Let's change that, ok guys?! With the longer days, I'm also finding it hard to want to leave Jim and Sully at home while I go to the gym which means I think maybe I need to attempt Child Minding at the gym again. Our first attempt didn't go well, but now that Sully is older, maybe he will do better. I guess we can only try! As I mentioned above, Jim's parents arrive on Thursday from Nova Scotia and will be in Alberta for an entire month! I'm actually really looking forward to their visit (which will be shared between us and Patty's sister in Red Deer) and I know Sully will be so excited to have them hear. He asks almost every day to call Nanny and Papa on Skype! I'm looking forward to having company during the day, and I'm also hoping that Jim and I will be able to get in a few date nights while they are here. We also have lots of things planned to do with them while they are here, including a little trip to Waterton next week! Ever since I went last fall, I've been waiting to go back, so I'm really excited to introduce Jim and his parents to it. I have a feeling June might be a bit quiet over here since I always struggle to balance blogging with visitors, but I'll pop in when I can. And I'll definitely be here for book club which I will announce tomorrow! And for all my lovely blogging friends out there - I have been reading your posts, just not commenting as much! Anyway! I hope everyone is having a lovely Monday! How did you spend your last weekend of May? 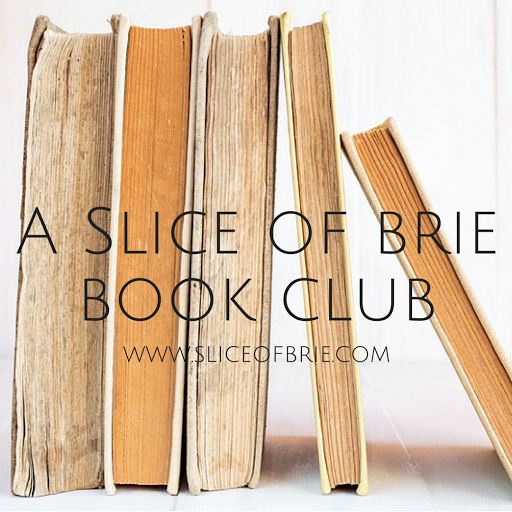 A Slice of Brie Book Club: June's Pick! Brie has read 4 books toward her goal of 24 books.